The British rock band "Queen" not only belongs to the most successful but also most important bands at all. They sold about 320 million sound carriers world wide. In addition they had more than 700 live performances. The group was founded in 1970 by Freddie Mercury, Brian May and Roger Taylor, one year later John Deacon joined the group. One of the unusual circumstances of Queen was that all four members contributed successful songs as a composer, e.g. Mercury's "We Are the Champions" and "Bohemian Rhapsody", May's "We Will Rock You", Taylor's "Radio Ga Ga" und Deacon's "Another One Bites the Dust". In total Mercury wrote 51 songs, May 46 songs, Taylor 22 songs and Deacon 14 songs. Queen managed the breakthrough in 1974 with the single "Seven Seas of Rhye" and the album "Queen II". The first album "Queen" was released in 1973. Since then Queen belongs to the regular guests in international hit parades. But before Queen has been founded there was a history before of course. To this history also belongs the special guitar of Brian May which he created together with his father in self-construction and which formed the later typical sound of Queen. Brian May met the musicians Tim Staffell, Roger Taylor und Farrokh Bulsara (der spätere Freddy Mercury) in 1966 but by the foundation of the band"Smile" only he, Staffell and Taylor were members of it, Mercury went as a singer to the group "Ibex". When Tim Staffel left "Smile" May, Taylor and Mercury got together and founded the band "Queen". When John Deacon joined the band in 1971 as a bassist a new chapter in music history has been turned over. The band remained together till Freddie Mercury's death. After their breakthrough in 1974 followed her third album with "Sheer Heart Attack", which came to place 2 of the British charts. When the song "Bohemian Rhapsody" enchanted the ears of music lovers in 1975, Queen conquered position one of the British charts finally. In the same year "Queen" also conquered the international music scene with the album "A Night at the Opera" and with it also the US market which opened them the floodgates. This album also came to position one of the British charts and was the first of their albums to reach this ranking. It followed the ablum "A Day at the Races" in 1976, whose name refers to a title of a Marx-Brothers movie like the album before. The album "News of the World" in 1977 and especially the extracted singles "We Are the Champions" and "We Will Rock You" became their literal signature tune and these songs represented Queen as no other of their songs. They released the album "Jazz" and the live album "Live Killers" in the next years. Queen catapulted themselves to position one of the US charts for the first time in 1980 with the song "Crazy Little Thing Called Love". At the same time the afterwards release album "The Game" became also number one in the USA and presenten Queen in a completely new look, both their appearence and their music. The enormous popularity and their distinctive music provoked film producer Dino De Laurentiis to let write the film music for his production "Flash Gordon" (80) by Queen - the music was later also released as an album. In 1981 followed live performances in different countries in front of a huge crowd in each case. With the later published song "Under Pressure" in cooperation with David Bowie followed the next international success and at the end of 1981 Queen release their first Best-Of-Album which flew off the shelves. The next albums of Queen were "Hot Space" 1982, "The Works" 1984, "A Kind of Magic" 1986 and "The Miracle" 1989 and there were again many tours like the Hot-Space world tour (82), Rock in Rio (85), the live aid charity-concert (85) by Bob Geldof, the Magic-Tour (85) and the Europe tour (86), which was the last one with all four original members. Although in those years followed other film compositions to movies like the reissue of the silent movie "Metropolis" from 1927 and the music to the feature film "The Highlander" (86). Afterwards they realised different individual projects, among others Roger Taylor founded the band "The Cross" and went on tour during the creative pause of Queen and Freddie Mercuy created together with Montserrat Caball the solo album "Barcelona". In 1989 it became obvious that Freddie Mercury (who already got the diagnosis AIDS in 1987) was ill but the public had still not been informed about it officially. But latest during the BRIT Award in 1990 it was clear for everyone, that the healthness of Mercury was affected seriously and this provoked wild guesses. Queen released the album "Innuendo" in 1991 and many lyrics were hints to Mercury's coming death. In the same year they published the album "Greatest Hits II". When there were more rumours in the newspapers about Mercury's illness he decided t inform the world public officially about his illness. Although many people already guessed his illness it still was a shock when Mercury announced it on November 23, 1991, all the more because the audience did not have enough time to digest the news when Freddie Mercury already died one day later as a result of his immune disease. 1992 veranstalteten Brian May, Roger Taylor and John Deacon arranged the Freddie Mercury Tribute Concert in London in 1992 where many other famous guest singers appeared and paid their last respects to Freddie Mercury. It lasted four years after Mercury's death till the album "Made in Heaven" which was in process since 1991 came to the market. On these album were also songs which were sung my Mercury briefly before his death. The remaining three members realised some more live performances till 1997, also in 1997 they released the compilation album "Queen Rocks", the album "Greatest Hits III" was published in 1999. 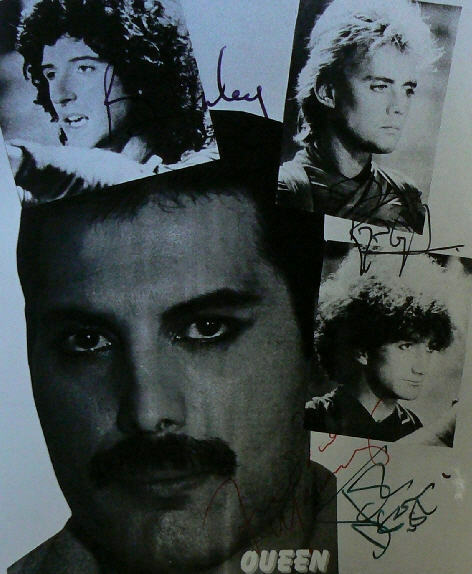 The members of Queen produced together with Ben Elton the musical "We Will Rock You" i 2002 which was performed successfully in many countries. Brian May and Roger Taylor went on tour with the singer Paul Rodgers und the band name "Queen + Paul Rodgers", John Deacon retired from the music business definitely beforehand. The formation remained till 2009. Freddie Mercury was born as Farrokh Bulsara in Stone Town, Zanzibar. He went to the residential "St. Peters" school in Panchgani, India from 1955 where they recognized his musical talent. He got piano lessons, was singing in a choir and took part in performances. He became a member of the school band "The Hectics" in 1958 and made first experiences with public performances. When he returned to Zanzibar in 1963 the country got its liberty in the same years whereon it came to a revolution in January 1964 against the sultan. The family Bulsara fled with their children to London where Mercury continued his education, first at the polytechnic, later at the Ealing College of Art where his second talent, the drawing, had been supported. Via his study colleagoue Tim Staffell he got in touch with the band "Smile" and learned something about the background of the British music scene. As a singer he appeared for the first time in England in 1969 for the band "Ibex". It followed appearances with the follow-up band "Wreckage" and with the band "Sour Milk Sea". With the breakup of "Smile" he founded together with the remaining members Brian May and Roger Taylor the band "Queen", Mercury also designed the logo. In 1970 he changed his name Freddie Bulsara and adopted the stage name Freddie Mercury. Private Mercury lived together with Mary Austin till their relationship came apart in friendship when he confess his homosexuality. Besides his domicile in London he also lived in New York and Munich from the middle of the 80s and temporarily he lived together with the actress Barbara Valentin. Jim Hutton became his life partner for six years from 1985. As a musician he published his first solo album in 1985 with "Mr. Bad Guy", in 1987 he appeared together with Montserrat Caballé on, at the end there came the famous album "Barcelona" into being. Freddie Mercury remained active as a musician and singer till to his last days although he was bodily limited. The other members of Queen wrote as many new songs as possible for him so he was able to sing these songs himself. When he closed his eyes forever on September 24, 1991, the world of music lost one of the most charismatic ambassadors. Brian May got first guitar educations by his father who himself played an Ukulele banjo in his freetime. From 1954 Brian May also learned how to play an acoustic guitar. Later he got a professional education in piano and he visited the music conservatory in London. Together with his father he built an electrical guitar in 1963 he called "Red Special" and which became his preferred instrument. In 1964 he founded his first band with "1984" and the band performed at different clubs and pubs. It followed the first concert at the St. Mary's Hall in Twickenham and in 1967 they were the supporting act for Jimi Hendrix. Besides music Brian May also studied physics and astronomy in London from 1965 and finished it successfully. After the breakup of "1984" he founded together with Staffell and Taylor the band "Smile" which only lasted for two years, afterwards he founded "Queen" and with it his life's work took form. Beside "Queen" he also realised some solo albums like "Star Fleet Project" (83), "Back to the Light" (92) and "Another World" (98). With "Furia" (00) came also his first filmsoundtrack into being. Brian May was married with Chrissy Mullen and has three children, the marriage became divorced in 1990 after 14 years. Ten years later he got married with the actress Anita Dobson. He got an honorary doctor in the field astronomy in 2002, three years later he was awarded with the order "Commander of the Order of the British Empire" (CBE). He finished his dissertation in astrophysics in 2007 with "Radial Velocities in the Zodiacal Dust Cloud" which remained unfinished for many years till then and in the same year he passed his disputation. The drummer Roger Meddows-Taylor was able to study at the boarding school Truro Cathedral School thanks to a stipend and made there his first musical experiences in a choir. He already mastered the instruments guitar and ukulele when he began to play the drums. The first band he took part was "The Reaction" in Cornwall which made him already well-known regionally. Roger Taylor began to study dental technology in 1967 but did not finish it and he dedicated to the biology. But he also did not finish this study too because the musice became a more and more important part of his life. So he got in touch with the group "Smile" when they were looking for a drummer. Via Tim Staffell he met Freddie Mercury and they shared a room later and led together a boutique at the Kensington Market. When "Smile" broke up he became a cofounder of "Queen" and it followed his most successful time of his career and concentrated exclusively to this engagement. Only in 1987 Roger Tayler founded the band "The Cross" (which endured till 1993) because "Queen" could not do any tours because of the illness of Mercury. Beside it he published four albums - "Fun in Space" 1981, "Strange Frontier" 1994, "Happiness?" 1994 and "Electric Fire" 1998. Roger Tayler was together with Freddie Mercury the wild part of "Queen" who were busy partygoers, in addition Taylor was not aversed against women, cars and alcohol. He got married with Dominique Beyrand in 1988. They knew each other already since 1976 and had children from their premarital relationship - but the marriage only had legitimate reasons and was divorced again in 2006. In reality he lived together with the model Debbie Leng since 1988 and they have three children together. But also this relationship went to pieces because of Taylor's affairs. He is married with Sarina Potgieter since 2010. The bassist John Richard Deacon was encouraged by his parents to play an instrument in young years and his fahter bought him a Tommy Steel special guitar. When John Deacon's father died in 1962 he intensified his efforts as a musician and finally he founded the band "The Opposition" where he first played the guitar and later the bass. He left the band in 1969 which called itself "The Art" now in order to go to the Chelsea College of Science and Technology where he studied electronics. After the degree of his studies he founded the band "Deacon" which remained active till to his passover to "Queen". He came to "Queen" because they were looking for a bassist because the actual one Doug Bogie apparently generated too much attentiveness. For John Deacon it was the chance of his life and he seized the opportunity. During his time with "Queen" he only realised few more solo projects, among them the single "No Turning Back" which he wrote for the movie "Biggles" (86). After the death of Freddie Mercury he only appeared very rarely as a musician in the public before he retired from the music business in 1997. John Deacon is married with Veronica Agnes Mary Tetzlaff and has six children.